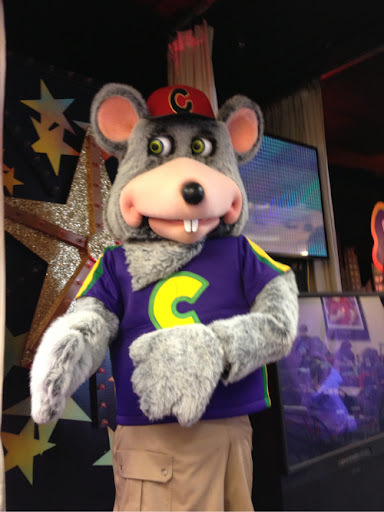 Dear Chuck E. Cheese, I hate you! First of all, we had soccer practice at 9am. Rocco wakes up with a blood sugar of 177. Good enough. Feed him standard blueberry Nutrigrain Eggo waffle (my trusted friend), an egg for good measure and milk. Give him insulin. Struggle to put weird nylon soccer socks on his feet while making sure I don't get overly frustrated at their tightness and yell at the tiny human I am pushing them on. Talk Rocco into going to his final practice. Bribe him by telling him he may get a trophy if he goes. Rocco loves a trophy! Why can't my kids just like sports for sports sake? Get to soccer. He runs. Runs some more. Get done with soccer. Check blood sugar - 62. Needs sugar. Burger King is right in front of Kmart, which is the place that holds the coveted Lego set for the birthday gift for the Chuck E. Cheese party. Rocco sees a mini-Cinnabon. Begs me. "Please! Please! Please! I have never had one." Look down at poor kid who feels slighted in life,with his pleading hypoglycemic eyes, and I cave. "Sure!" Look up carbs - 45. Good Lord! Eat. Give insulin. Come home to gather up Zeke, who has been home with daddy all morning watching TV and eating junk cereal. 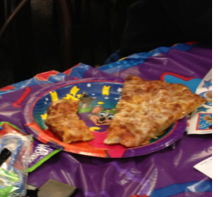 Go to Chuck E. Cheese party. Ugh! Just the smell of the place makes me feel flu-like! Just keep moving through the germ filled stranger kids and pretend that you like this. Decide to eat at Panera next door while they are there. More quiet and close enough to helicopter over during the party. 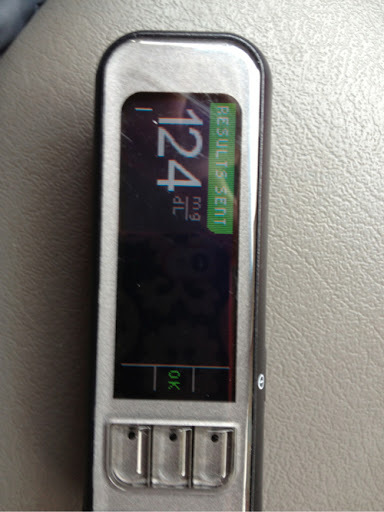 Before I leave for lunch, check his blood sugar. He is 54. Soccer practice exercise starting to hit him. Crap! Give a juice box and a tablet. Yell at myself for feeding my kid crap all morning. Talk myself off the ledge while I wait for juice and tablet to kick in. Life's too short to blame yourself for stupid things. Check again in ten minutes. 110. Perfect! Time for Panera. Explain diabetes to the party mom. She has had parties previously, and we have had her son in Rocco's class for the past three years, so she pretty much knows the drill. But because of the "pretty much" part, I tell her I will helicopter back in 45 minutes when they serve the food, to give Rocco his insulin. Go to Panera. Try to concentrate and write for 40 minutes. Order salad because I got a Cinnabon at Burger King too! Due to recent paczkis, shamrock shakes and Girl Scout cookies, I feel more round than usual. Think about joining Weight Watchers but thought quickly leaves my mind as I realize I already have too many thoughts of counting carbs that infiltrate my life. Thinking of counting food points for myself seems too much for today. Just promise to eat more salads. Life's too short to blame yourself for stupid things. Go back to Chuck E. Cheese. Crap! They started the food part early. Pizza already devoured. Something dark brown in all cups. Yep! Coke. Straight up Coke. 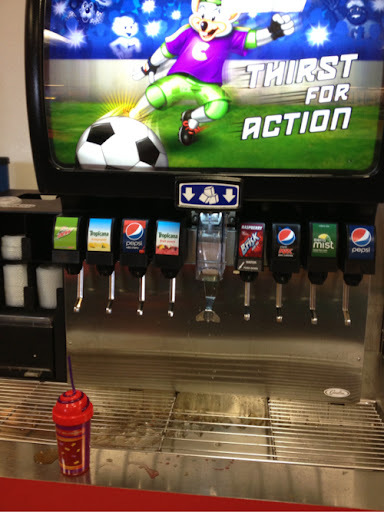 One of the only things I sort of like about good ole Chuck E Cheese is that they have caffeine-free,Diet Coke available. 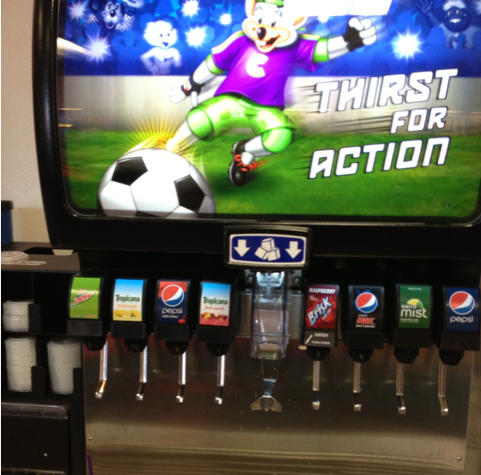 Grab Rocco's cup and go fill it up secretly with the caffeine-freeDiet Coke. Come back nonchalant, so the party mom and Rocco won't notice. Feeling like crazy, over-bearing, over-protective mom - yet again. Wonder what nearby moms think of me. Decide to forget worrying about something I cannot control. Life's too short to worry about... You get the point. Diet Coke replacing regular Coke saves us 45 carbs. Just as I breathe a sigh of relief, I hear, "Who wants cake and...." wait for it.... "ICE CREAM!!" And the crowd goes wild! Roooooaaarrr!! I deflate into a person about three inches tall. I can handle the pizza, I fixed the Coke. 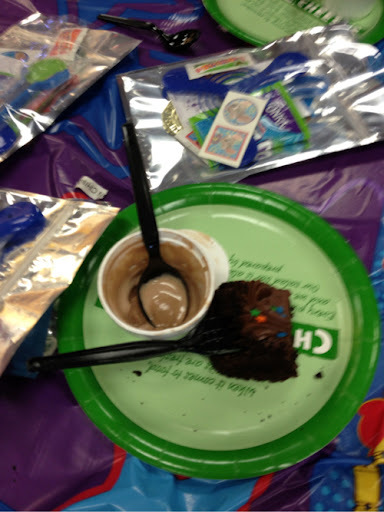 I was going to super dose him for the chocolate cake with extra chocolate frosting. But the ice cream and the screaming made me wanna yell, "OH, COME ON!!!" Have visions of losing it and getting up on stage and punching the stupid mouse in the face! 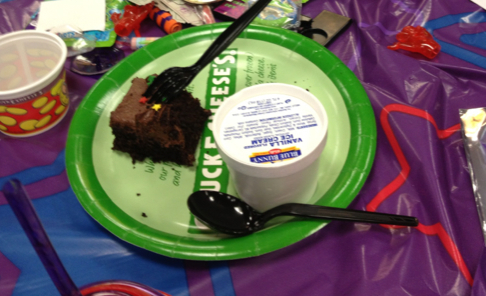 So I get mad at diabetes and grab Rocco’s pump and try to preempt all the sugar while they cut the cake. I dose Rocco for 75 carbs, which should cover the pizza, the couple of sips of regular Coke he drank before I got there, the chocolate cake and yes, the ice cream. Watch him eat half of the ice cream, take a bite of the cake and then someone yells, "Who wants to play games?" Rocco jumps up and yells "ME!" and almost runs off,except I grab him and say, "You have to eat your cake and ice cream." He gives me the face like he is going to puke and says, "I don't really like it." OH MY GOSH! Any other time, I would have kissed him and the angels that guide us daily. Except now what? He has at least 35 extra carbs worth of insulin in him. So, I go back to the pop machine. Throw away the caffeine-free diet and fill the cup up with none other than, wait for it...fruit punch!! Try to make him drink it. He takes three big sips and gives me the puke face again... Darn it! I decide to stay at the God-forsaken place and hover. I sit in a booth and try to look busy, but my mind is racing and I’m watching for him to go low. I only have about another half hour in the stupid place, and I feel like he should be ok as long as I stay. So much for writing time. As I sit, I remember I have another child who’s at the party. Zeke! I go over to him, try to make up for being distracted and give him a kiss on the cheek. 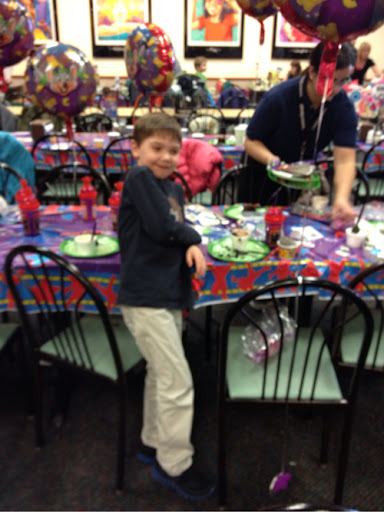 RIGHT IN FRONT OF HIS FRIENDS.... His embarrassed seven-year-old self wiggles away. I die a little inside. Friends don't notice. Thank God. Forget it. I give up. I would like to go get a one-hour, full-body massage, please! Finally, the stupid party is over and it is time to cash in the tickets. You know, those precious tickets that they "earn" while playing the games with the flu-filled coins? Pretty fun, except feeding them into the munching machine to get a toy/treat coupon takes about an HOUR AND A HALF! 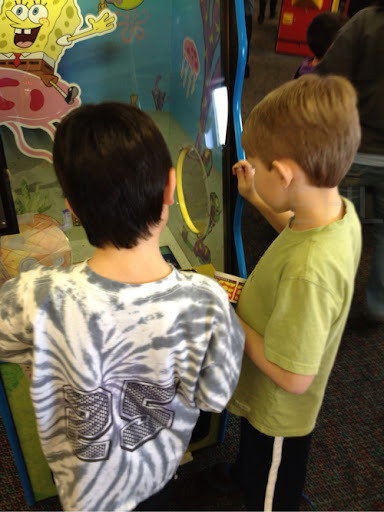 I see one of Rocco's friends help him feed his coins intothe machine. 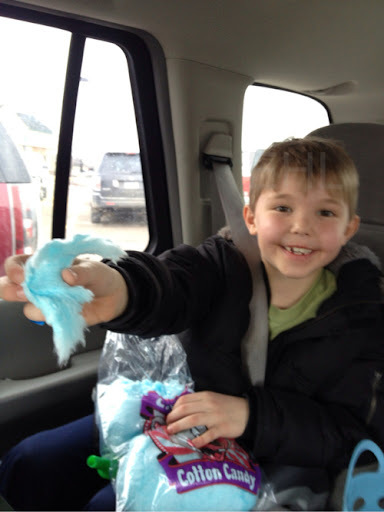 wait for it........ COTTON CANDY!! OMG! He is so excited. I am hoping he doesn't see the look of panic in my eyes as I try to eyeball the bag for the carb count. Finally get the two of them in the car while they are playing with the plastic, rainbow slinky (which breaks on the way home). I decide to check Rocco AGAIN and to my delight he is 124! Yippee. He begs me to have some of his cotton candy. I cave AGAIN. ,which amounts to only about 15 carbs. I look from the bag to his face and he gives me a groan and the puke face again. Thank God! Dose him for 20 carbs just to be sure. I checked him an hour later as the day filtered through his body. 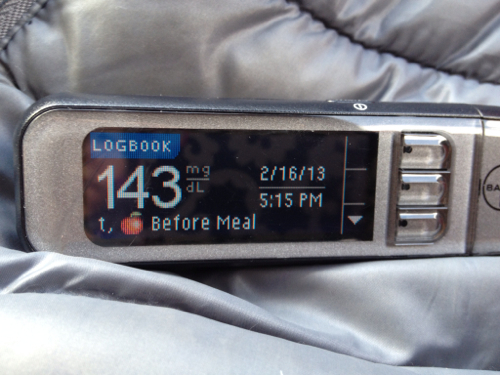 These are the times you expect to see either a 400 blood sugar or a 40 blood sugar. Much to my delight it was neither. Loved this!! 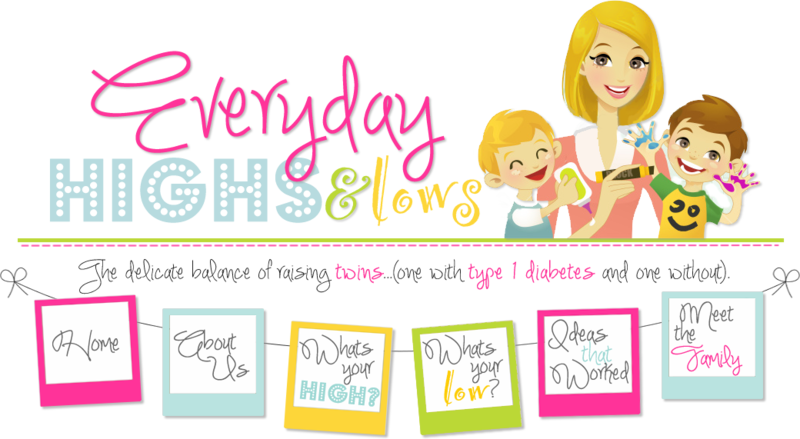 I'm new to your blog but am so glad I found it. 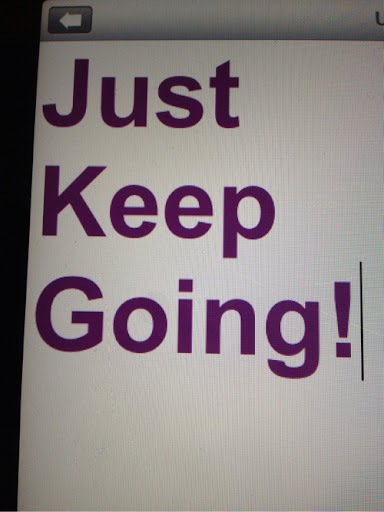 I'm a T1 mom to soon to be four boys, two of whom are twins (2 years old) who both have T1D too. I'm am very nervous for birthday parties that I don't have complete control over but it's good to see how others manage just fine! !